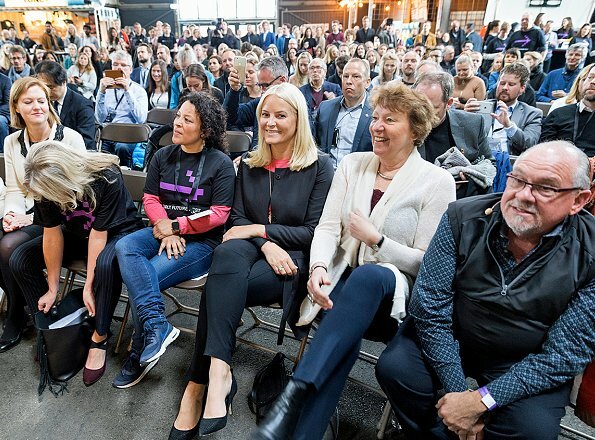 On May 12, 2017, Crown Princess Mette-Marit attended "Katapult Future Fest" festival held in Vippa, Oslo. Katapult Future Fest is a two days festival and a non-profit event that has been established for the purpose of ensuring cooperation between businesses and investors and encouraging social solidarity by means of technology. Thankful she didn't wear that old black ruffled jacket. 3rd picture: the shoes. For me it's tough. And I bet they are not cheap ones. But it looks cheap. (Look to the Ladie's feet. Well done.) Most clothes are always to tight, to short... Or is it just me? She just seema to be someone who prefers her comfy old clothes. Nothing wrong with that as I like my comfy clothes too. But as the CP a little more effort would be nice. She is all smiling, I like that, but I don't know what to think about clothes, they don't really fit - are they too big or too small? Yes, Diane, I guess you're right. It's just so ordinary. No flair, no sense that she cares about looking nice. It seems a shame to only be able to say "she looks okay". Many come from bad circumstances. That doesn't make them less than those that come from better circumstances. Not sure where you come from Miracle but obviously manners, grace and class eluded you. Miracle, prefacing a comment with "I don't want to be mean" does not change the fact that your comment is so. Not everybody born with a silver spoon is elegant or gracious. Coming from an unprivileged background does not preclude style and elegance. It shouldn't be so difficult to offer a fashion critique without judging a person's past. Miracle, the only thing I see is a woman for our time doing her job properly.